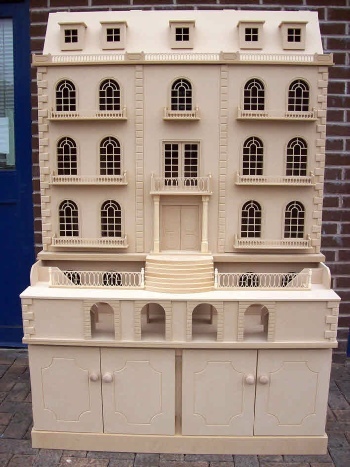 The Ashthorpe Manor is our most popular large dolls house within our ever expanding range. The house is so popular that we have now added a basement to complement this magnificent Georgian Mansion. Window sills that slot into place. New design arch window that slots into place on the inside of the house allowing you to fit your own 2 mm glazing if required. Optional Perspex windows, skirting boards, coving and dado rails. Optional purpose built cabinet with two sliding shelves. 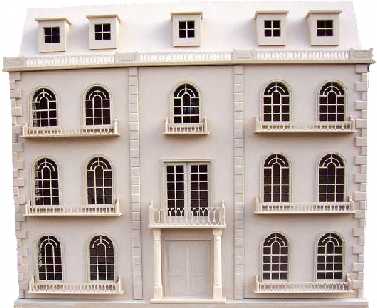 For ease of decoration, the windows, doors, dormers, internal/external moulding's, railings, window boxes etc, are not glued into place. 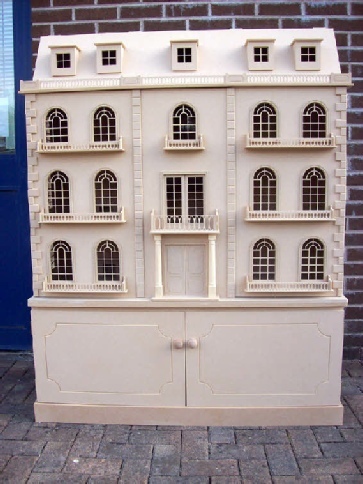 Please be aware that if you order the Ashthorpe Manor with the basement you will require the deep cabinet to accommodate the basement front. If the basement is required there will be a stair cut-out in the base of the house and also a stair cut -out in the top of the basement to allow the stairs to lead into the house. Delivery is approximately 28 days from date of order. Ashthorpe Manor is constructed with the aid of the latest computer controlled CNC technology ensuring all components fit exactly into place, therefore no alterations can be made from the original design once order is placed.